Clients enthuse that "she's superb and very reliable," emphasising that she is "a savvy negotiator who understands client needs, makes herself available and really puts the client first." 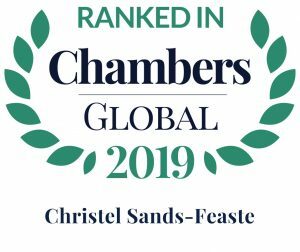 Christel Sands-Feaste is a highly experienced commercial lawyer who focuses her practice on corporate and commercial law, asset financing, resort development and operations, gaming law and regulation, securities and investment fund matters. 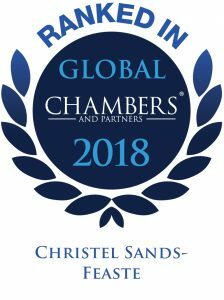 Christel provides advice on a variety of large-scale complex corporate and commercial matters, including M&A transactions, securing governmental and regulatory approvals, asset financing, private placements of offshore securities, and investment fund structuring and creation. She represents both domestic and foreign clients in a variety of businesses in the financial services, hospitality, gaming and life sciences industries. Christel regularly advises clients on day-to-day legal issues, including licensing and compliance matters as well as other general corporate and operational activities, and estate planning. Her clients include financial institutions, securities intermediaries, real estate developers, resort operators, non-profit organizations and individuals. Christel currently serves as chair of the Financial Services Law & Regulation and Securities & Investment practice groups and is named as a “Leading Commercial Lawyer” in both Chambers Global and the International Financial Law Review (IFLR1000). 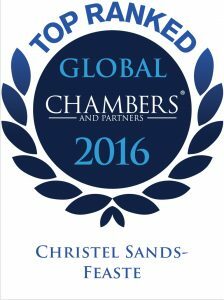 She and has been recommended by Global Law Experts in Mergers & Acquisitions Law. In 2014 she received the Bahamas Financial Services Board’s (BFSB) award for Financial Services Development & Promotion as a member of the Working Group responsible for the launch of the groundbreaking Bahamas Investment Condominium (ICON) legal structure. 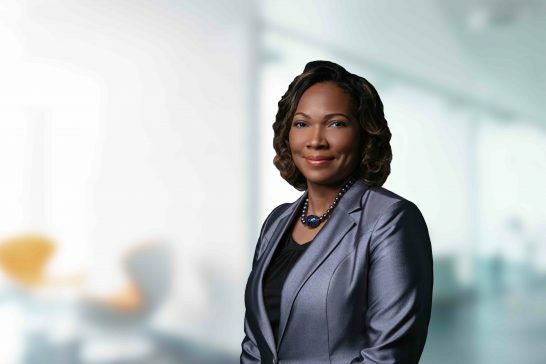 Prior to joining the firm as a partner in 2009, she served as Vice President – Legal for a family office and a leading Bahamian development company. Christel is a Director of the Bahamas Chamber of Commerce and Employers Confederation, and Co-chairperson of its Ease of Doing Business Division. She is member of the International Association of Gaming Advisors, the Bahamas Bar Association, the FinTech and Investment Funds working groups of the Bahamas Financial Services Board, the Project Team appointed by the Securities Commission of The Bahamas to draft the new Investment Funds legislation, and the Nassau Chapter of Links Incorporated. She is a former Director of the Bahamas Financial Services Board and former Vice Chairman of the Bahamas Hospitals and Health Care Facilities Licensing Board. Acted as Bahamian Counsel for a client acquiring a stem cell therapy clinic; involved in advising on all aspects on the transaction including contractual review and advising on regulatory and tax matters; obtaining all required approvals. Acted as Bahamian Counsel in connection with a transaction involving (i) a $500MM first priority secured note facility and (ii) a $134MM second priority secured note facility. Involved with advising the Note Purchasers on all Bahamian matters relating to both facilities including, reviewing loan, security and corporate documentation, drafting security documentation and perfecting security. Counsel for the Developer on Bahamian issues relating to a resort development, including government and regulatory approvals, real estate and other issues. Phase 1 of a multi-phased Project is estimated at $100,000,000. The Project will operated by a five star hotel operator and will be the largest of its kind on the relevant Island in The Bahamas. Advised on the formation and establishment of a cryptocurrency investment fund. 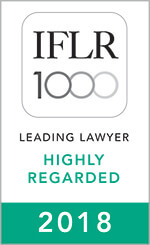 Described by peers as a "a very good, capable lawyer," Christel enjoys a strong reputation across a number of areas with a market commentator noting that she is "very good at what she does."